The top hitmakers chart is compiled weekly based on the Billboard Hot 100. Each song on the Hot 100 is given a descending point value based on its position on the chart. Then the song’s points are divided equally between the songwriters credited. 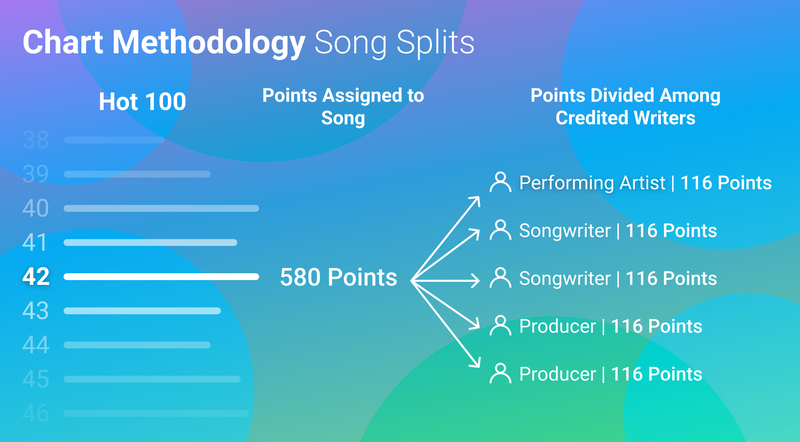 Those songwriters are then ranked based on who has the most total points. A number of factors can affect a songwriter’s point total. One obviously is chart position…the higher the chart position, the more points there are to split among songwriters. Another factor is the number of songwriters splitting the point total for a single song. Our ranking formula is more generous to songwriters who either have greater shares on songs or who have shares across multiple songs. The intent of the chart is to shine the spotlight on the under-appreciated creatives of the music industry, like songwriters.